Allan McDonald works in the space between documentary and art photography with issues of place and social history. 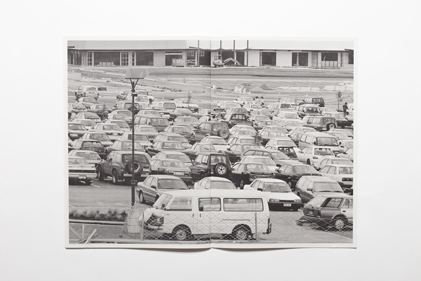 He works with old and new images to curate narratives of New Zealand social and vernacular history. 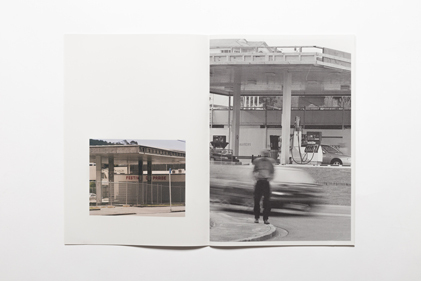 Carbon Empire juxtaposes images of closed petrol stations with a series of staged photographs of a ‘man in the street’ in Auckland’s industrial suburbs. They reflect the effects of the deregulation of the petroleum sector in 1998, which led to the demise of many small operators. The book also comments on society’s move away from fossil fuels and what could be the end of an era. An outstanding publication where photography, design, editing and production come together to support an original and contemporary concept. 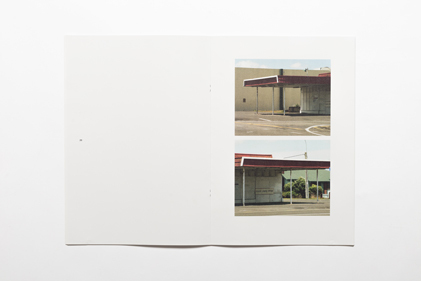 The work takes great care with its available materials, utilising an almost beautiful restraint to address global issues via local photographs of abandoned petrol stations, and a figure alone in the street. McDonald recently completed a Bachelor of Design with First Class Honours at Massey University, Wellington, during which time she also studied in Nottingham, England. 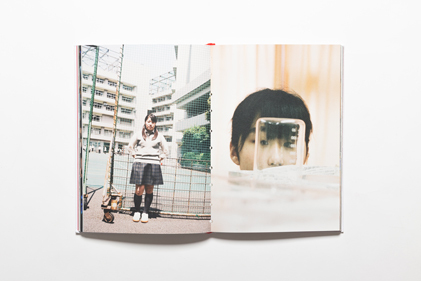 A joyful abundance of pictures, superbly sequenced to take the viewer right into this classroom of Japanese girls. It uses the language of repetition in a deliberate and successful manner, and makes you want to turn and look over the pages many times. 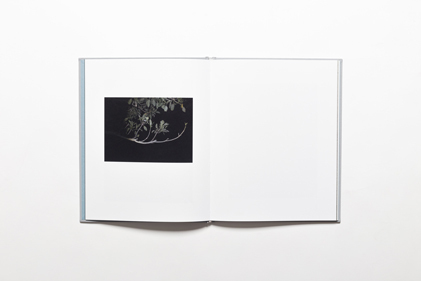 Purdom’s work comments on people’s influence on the environment and society’s preconceptions of the picturesque. 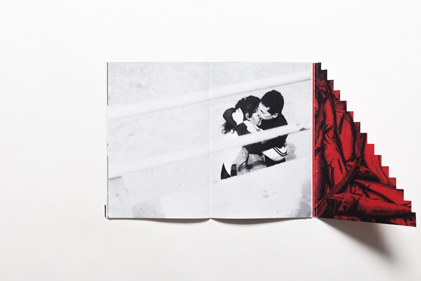 He was co-winner of the New Zealand Photobook of the Year Award 2015, and is currently lecturing at the School of Media Arts, Waikato Institute of Technology, Hamilton. 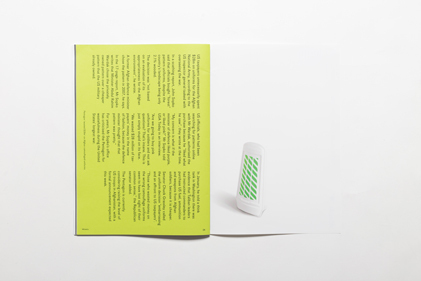 Mimetic is an examination of nature’s survival strategies of mimicry, camouflage and deception, and of how humans have adopted these activities into their everyday lives. 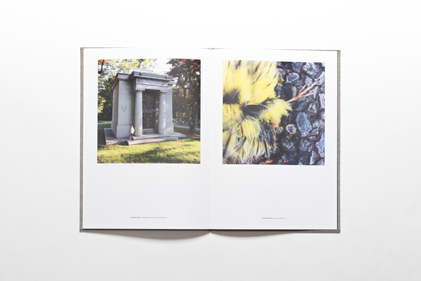 The book features pages of research ephemera, poetry, technical illustrations and text that influenced the aesthetic and conceptual direction of the project. 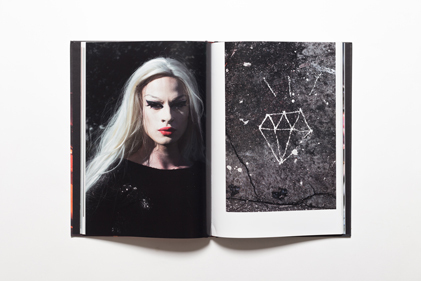 Mimetic is complex, provocative and playful. The design and the photography talk to each other beautifully, so that the design successfully alters the meaning of the photographs in a positive way. The minimal budget and modest production values still resulted in a great work. Daly graduated with an Honours Degree in Photography from Massey University, Wellington in 2013, and is now based in Melbourne. Her work presents urban environments where she searches for moments of serendipity and stillness amongst the chaos of daily life. “Heaven, is a place, where nothing ever happens” sang David Byrne in 1979. 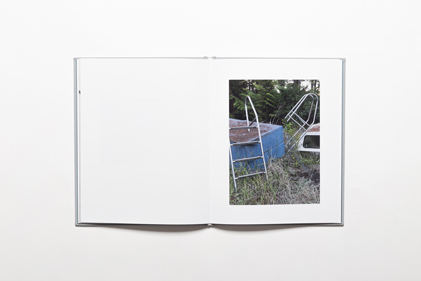 Daly applies this nihilistic framework to her photographs from locations around the world. Captured on black and white film, the photographs can be viewed as tiny fragments of internal reflection, hedonism, oblivion, existential desire and the inherent loneliness of the human condition. 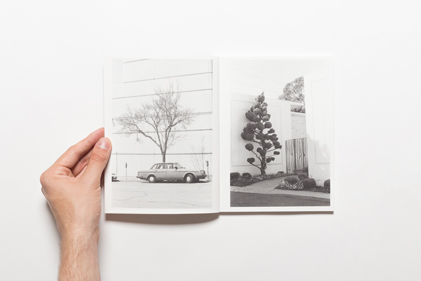 Nothing Ever Happens is photographically fresh and edgy. The offbeat emptiness of the images and narrative are appealing, while the restraint in the materiality and presentation works successfully. 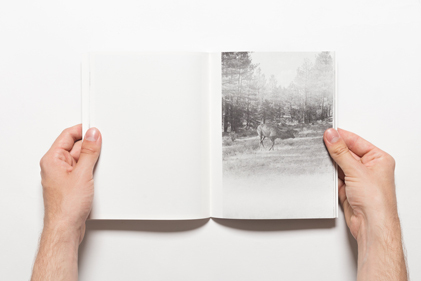 Incorporating the analogue process errors in the images creates a more powerful result. At Rest. A Road Trip To Anthropocene. Greive spent his professional career working in advertising for organisations including Saatchi & Saatchi Wellington. He has now moved on to more rewarding briefs - his own projects. At Rest is the first of them. This book sets out to explore the new climate epoch anthropocene. While anthropocene is the result of many interventions by man on earth’s eco systems Greive looks at just one aspect - the modern transport industry. In so doing he questions what psychological drivers are behind this impact. A quiet, serene and powerful study of the anthropocene. 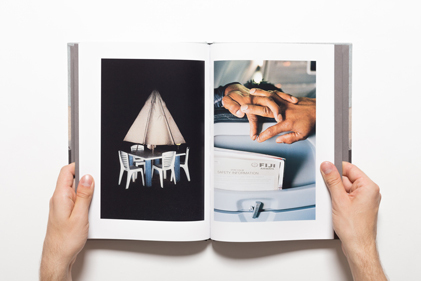 It pursues a subject not easily considered through photographs. The counterpoint of road kill images with graves of motor industry moguls is simple but compelling. Michael Mahne Lamb is a Wellington based artist with a Bachelor of Design (Honours) from Massey University. His recent photographic work explores how images can stimulate the mind through the activation of amodal perception. 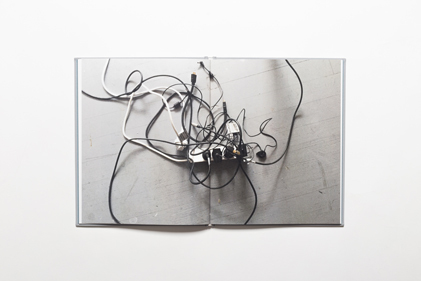 Lamb’s first monograph, Complements, is inspired by Rudolf Arnheim’s seminal work on art and psychology, Visual Thinking. 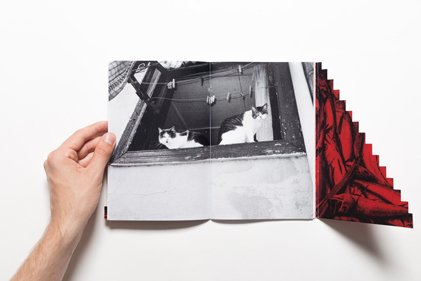 By using the book format Lamb adds an extra layer to the theory through the mise-en-page, where the pairing of two equivalent photographs create a micro-narrative on each spread. Every page sings! 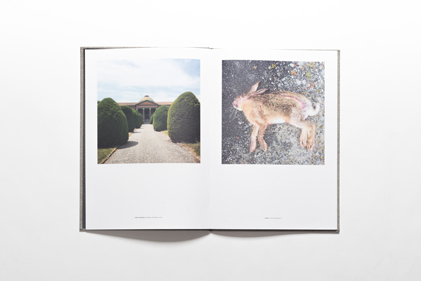 The superbly shot witty and complex images, combined with space and rhythm, make this a simple, effortless and elegant read. 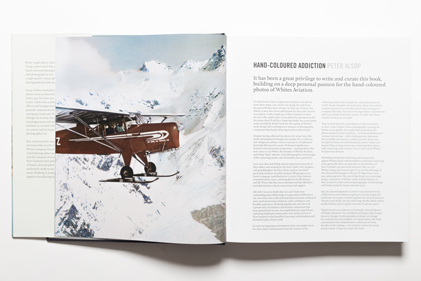 Peter Alsop is the author, curator and researcher of this important historical document that tells the story of long-running Auckland company, Whites Aviation Ltd, and its pivotal role in turning photography into an art form in New Zealand. It reveals the work of two key local photographers, Leo White and Clyde Stewart, who together produced some of the country’s best hand-coloured photos, and created iconic vistas that have adorned offices and lounges around the land for over 40 years. 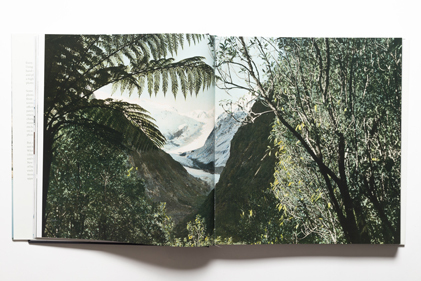 A celebration of a hugely important New Zealand icon, in a solid book design with elegant typography, high production values and beautiful reproductions. Jamie Bowering (b.1977) is an Auckland based photographer who captures the silence and timelessness of urban landscapes. He takes otherwise ordinary moments and turns our attention to the beauty of their simplicity. 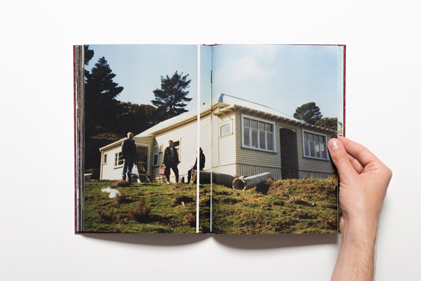 Bowering documented a series of swings and roundabouts devoid of any life or activity, in suburban New Zealand, to create a publication that would promote his photography. 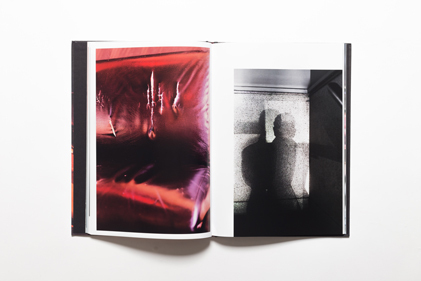 The resulting images take the reader on a journey from casual enquiry about mood, to considered observations on the built environment. A simple idea beautifully realised. 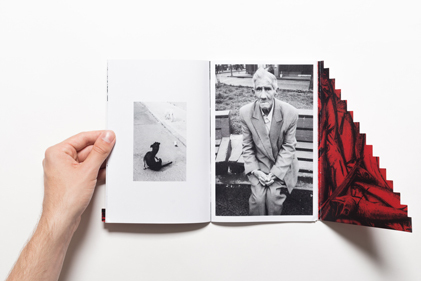 A complete package with brave subject matter, excellent photography and a quirky design. Inspired by Roland Barthes theory that, “The Operator is photographer. The Spectator is ourselves. And the person or thing photographed is the target,” Chisolm’s photographic projects involve all three roles and emotions. By interfering with her family’s photographic records, she becomes a part of the history rather than just a witness to it. 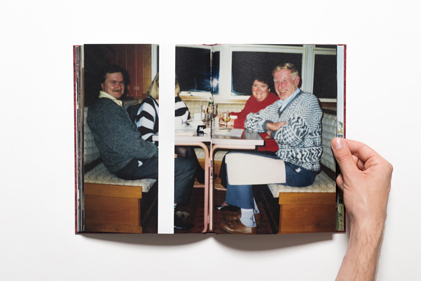 Chisolm has taken photographs of her mum found in her grandmother’s photo albums, and obscures the face with graphics that remove identifying features, therefore disrupting the meaning of the original photograph. 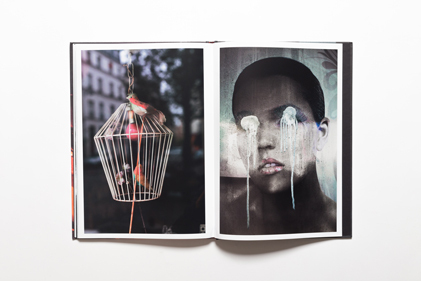 The resulting collages are combined with text from an interview with her mother, to create a fictional narrative about a falling out with her in-laws. The deeper we went into this the more we found ourselves empathising with the disappeared wife. The edits to the original photographs were a design decision played to great affect. The Essence Archive is an art collective founded in 2016 by Auckland-based photographers Tim Mackrell and Yvonne Shaw. 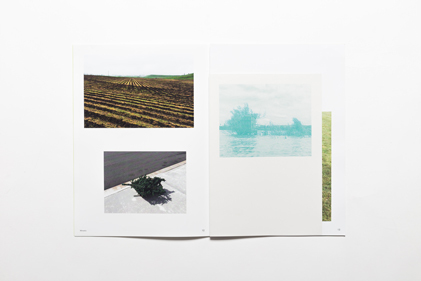 Both artists incorporate found images, places, and constructed scenes within their photography practices. Retrograde Motion is their first collective project. ‘Retrograde motion’ is an illusion observed by astronomers when the outer planets appear to reverse course in the sky. 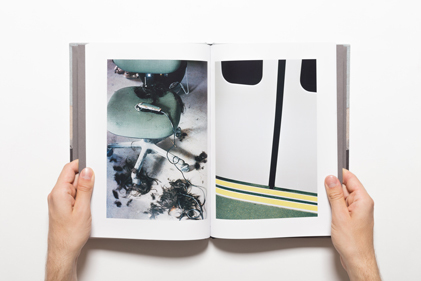 It also forms the title of this non-linear narrative in which photographs of domestic interiors and public spaces are sequenced with archaeological landscapes and text to evoke a sense of impermanence. 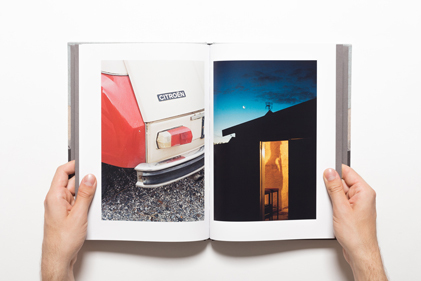 It is a response to the vanishing luminosity of photos in an increasingly digital era. 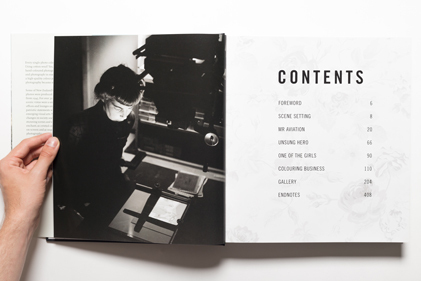 The interaction between the images sets up space for the story to be revealed and, while the production values are not extravagant, they are perfectly suited to the purpose of the work. 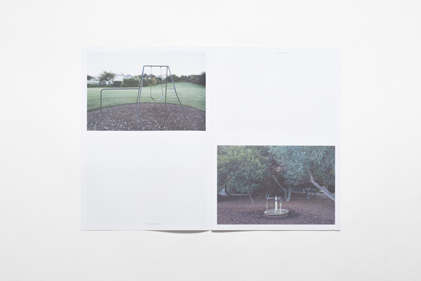 Benge is a prolific photo book maker who moves between Auckland and Paris. His pictures explore the strange anthropology of cities, the overlooked in the human landscape, as well as the idea of parallel lives - when one thing is happening here, something else is happening over there. The Lament is part fiction and part autobiography. The photos look at the unusual and the perverse, they make obscure connections and exploit the unexpected. Nothing is as it seems, though we nevertheless sense there is a truth in everything. A dry sense of humour runs through the work and if you look hard enough you might even spot a sense of optimism. 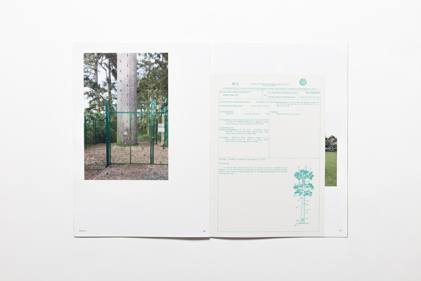 It asks the viewer to bring their own life experience to the reading of the work. Weird, nasty, beguiling and beautiful. Compelling images and brilliant sequencing create a mysterious storyline that seems to make sense until you put the book down. Chris Leskovsek was born in 1982 in Santiago, Chile. He now lives and works in Auckland, New Zealand. He has self published numerous photo books, and in 2017 he won the People’s Choice Award at the Miami Street Photography Festival. Valparaiso is a coastal port of Chile that is growing old and so are its people. This photo portrait strives to encapsulate everything that Valpo offers - beauty in its bare simplicity. There’s nothing pretentious about it, its strategically printed on cheap paper, and its quirky covers are a nod to the steep and endless stairs that greet anyone who visits. Its postcard size also makes it easy to share and post around the world. Valpo dares to do something different. It is very much a moment in time, a journey through everyday vernacular. It captures the quick poetry of the city honestly and without being forced. 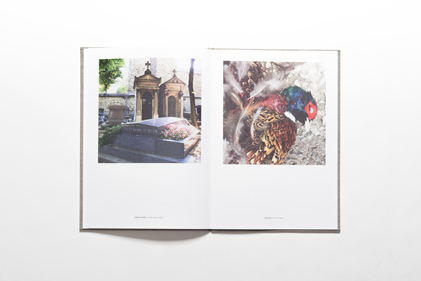 The well considered design matches the book’s intention to bring the city to life. Valpo is extremely touching.